Summers can be unbelievably hot in our neck of the woods, and because of the general conditions in Southern California, we have to do more than just address the heat. Air conditioners can keep temperatures cool, but they’re less able to deal with germs, bacteria and allergens that can flood our homes during the summer months. This is an issue for almost every home, but is particularly concerning for homes that have vulnerable family members, such as infants, the elderly or those suffering from conditions such as asthma. You can treat the issue with filters, which come standard issue for most air conditioners, and which should be periodically replaced with new versions from the hardware store. But they can’t eliminate germs and biological contaminants in a way that makes for a truly healthy home. A UV air purifier installed in your system makes a great alternative model, and can make your family much less prone to illnesses this summer. How? Read on for the answers. At that level, it’s quite harmless to humans and other multicellular organisms like dogs, cats, and even goldfish. For tiny one-celled organisms like germs and bacteria, however, it’s a much different story. Exposure to UV light will either kill them instantly or render them incapable of reproducing. It’s not hard to see how that ability can help keep your home clean and healthy. Certainly, one can’t simply cover the house in UV lights to get rid of germs. 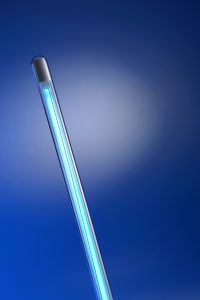 But your central air conditioner makes effective use of UV lights much easier. When you run your AC, the air cycles through the system, passing through the apex of your ducts before being distributed through your home. A UV air purifier shins UV light in a sheet across the width of the ducts, forcing the air through it. In the process, it sterilizes all the germs and bacteria in the air: gradually scrubbing the air clean in the process. It’s an effective system in large part because it works every time you turn on your AC: ensuring that new germs brought in from outside get treated the same way existing germs are. Over time, you’ll see big differences in your family’s health, as well as a fresher cleaner feeling in your home overall. If you think a UV air purifier would be a good fit for your Whittier, CA home, now is the time to schedule an installation. Call Greenleaf Heating & Cooling today to make an appointment!